The profitability of high performance lambing systems depends on targeting those management practices that are cost effective and will improve lamb survival. Most lamb loss occurs in the first three days after birth so reducing lamb losses must focus on factors that can improve survival of new-born lambs. As the condition score of ewes at lambing increases, so does lamb survival, especially in twin bearing ewes. Select a lambing time likely to maximise survival of new-born lambs. Manage ewe density and mob size for best lambing results. Early selection and pasture preparation in lambing paddocks ensures that lambs reach target weaning weights. Select a lambing time that is likely to maximise survival of new-born lambs. 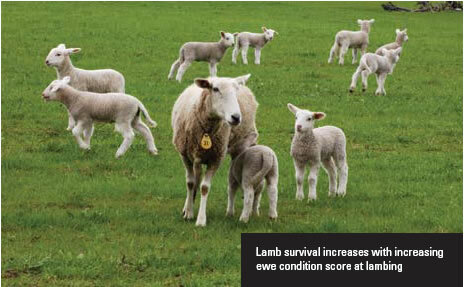 Ewe condition at lambing is the most important determinant of lamb survival, due to its effect on lambs birth weights. Cold, wet and windy weather increases lamb mortality, particularly with lambs that have a low birth weight. Manage ewes to minimise the impact of weather at lambing. Plan to have sheltered paddocks available for lambing. Early selection of lambing paddocks on the basis of size, availability of shelter, and pasture quality and quantity available for ewes are critical management decisions affecting the ability to wean more lambs. The effects of prolonged birth and the combination of hunger and mismothering account for the majority of lamb deaths. If ewe nutrition is poor, there is delayed production of colostrum and new-born lambs are at risk if they do not receive a drink soon after birth. In addition, mothering ability and lamb behaviour are depressed when ewe nutrition is poor. The longer a ewe stays at the birth site, the greater the chance of the ewe and lamb forming a bond. Depending on the individual ewe and the breed type, it takes up to six hours for a ewe to recognise her lamb and in this time a ewe may accept any lamb as her own. It also takes lambs twice as long to recognise their mothers and if a lamb is abandoned within six hours of birth it has little chance of survival. Merino ewes do not recognise twins very well. Ewes about to give birth may ‘pirate’ recently born lambs only to abandon them when their own lamb is born. When the number of ewes lambing is at its peak, the lambing paddock is a busy and cluttered place. Best practice is to minimise any disturbance in the lambing flock. Predators can account for between 5–10% of losses in some situations. But predators are usually of secondary importance compared with hunger, mismothering and hypothermia. When predators are known to cause lamb loss, start baiting well before lambing and continue until well into lambing. As ewe condition score at lambing increases, so does lamb survival, especially in twin bearing ewes. In the period from three days after birth to before weaning, aim to keep lamb death rates at less than 3%. Several key features need to be considered when selecting lambing paddocks. - Mixed perennial pastures: FOO of at least 1,200kg green DM/ha in lambing paddocks, and preferably more with twin lambing groups. - On annual clover-based pastures, FOO of 1,500-1,800 kg green DM/ha is recommended at commencement of lambing. - Prioritise the available pasture resources to ensure paddocks have adequate quantity for ewes at lambing. If pasture is likely to be limited during lambing, save pasture in early pregnancy or consider adopting strategies to increase pasture production. If pasture availability targets cannot be met on a regular basis use tool 10.2 to review your current lambing time. The factors contributing to the risk of hypothermia in lambs include combinations of temperature, rainfall and wind speed. Of these, only wind speed can be controlled by using naturally sheltered lambing paddocks. As a guide, sheltered paddocks can reduce lamb mortality rates by about 10% but shelter will provide less benefit if lambing in location/seasons with mild weather. Ideally, lambing paddocks that are sheltered from the prevailing winds and provide shelter over the entire paddock are best for lambing. Satisfactory shelter can be provided by trees, shrubs and tussocks. It is important that shelter belts are designed properly otherwise they may act as wind tunnels when grazing livestock remove the foliage from the lower branches (see procedure 5.3 in Protect Your Farm’s Natural Assets). When selecting lambing paddocks, consider the sheep grazing behaviour and paddock characteristics and avoid those where ewes are likely to lamb in exposed areas. Preferred paddocks are north and east facing, have good sunlight in the morning, are well drained and provide good access to water. In high rainfall regions, gastrointestinal parasites are a major cause of production loss in ewes and poor growth in lambs. Ideally, graze ewes on paddocks with low worm contamination during lambing. Worm management is discussed in procedure 11.2 in Healthy and Contented Sheep. 18 ewes/ha in twin lambing paddocks. A smaller mob size will also improve lamb survival, most probably due to lower incidence of mismothering. These are only guides and many other factors must be considered, including the cost of subdivision and management issues with extra mobs. The main predators of new-born lambs are foxes and in some regions, wild dogs and pigs. In some circumstances predators can kill more than 10% of lambs. 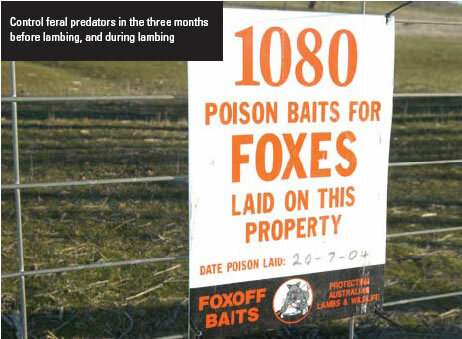 If foxes are a problem, baiting in the three months before lambing and during lambing, is recommended (see tool 5.11 in Protect Your Farm’s Natural Assets). Pig predation is best managed by selecting lambing paddocks where pigs can be controlled. Investigate excessive new-born lamb losses and discuss with your animal health or livestock adviser. Tool 10.8 contains a check list to diagnose common causes of lamb losses so you can improve management to reduce deaths in future years. Best practice is to minimise the disturbance of the lambing flock. If supervision is warranted, the best time to enter the maternity paddock is in the early afternoon. Develop a routine so ewes will become accustomed to human presence and will not leave their lambs. Injured ewes/lambs should be assisted or humanely destroyed. Losses associated with marking are normally less than 1%. Time marking and mulesing for about two weeks after the last possible lambing date. Hygiene is most important for equipment. Conduct mulesing in accordance with industry guidelines using an accredited operator (see signposts). 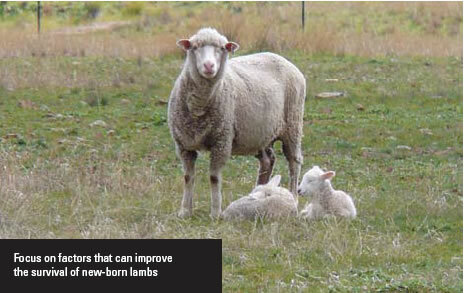 If mulesing is conducted when flystrike is possible, treat lambs with a product to prevent flystrike on healing wounds. Carry out marking and mulesing in clean yards close to the paddock being grazed and ensure the operation is completed early in the day so ewes and lambs can successfully mother up. For guidelines on additional health treatments, refer to procedure 11.5 in Healthy and Contented Sheep. To achieve target weaning weights ewes and lambs need to graze high-quality pasture. Pasture quality (especially legume content) and quantity are the best indicators of potential lamb growth rates. In mixed perennial pastures - if pasture availability falls below the critical limit of 1,000 kg green DM/ha or in annual based pastures below 1,200 FOO after the start of lambing, supplementary feeding may be necessary. Mismothering losses due to feeding are likely to be lower if paddocks and mob sizes are smaller. When available feed resources are low, consider identifying ewes that have lost their lambs or failed to lamb, at marking and remove them to save pasture for lactating ewes. Dry ewes can be managed separately or sold. Train lambs to feed supplements by ‘imprint’ feeding before weaning. Feed lambs at least 4-5 times while with their mothers using the supplement most commonly used on the farm at a low rate. The idea is to introduce the lambs to feed so they can recognise the supplement after they are weaned. This is an important management strategy that reduces the period taken to train sheep to eat a supplement once they are weaned. Managing Ewes in late pregnancy - Practical Wisdom notes, Sheep CRC. Click here to download. National Mulesing Accreditation Manual – details the preparation and planning, mulesing equipment, chemical and animal health product use and mulesing procedures that meet the welfare standards in the Code of Practice for the Welfare of Animals: the Sheep. To receive a copy of the manual from AWI, or to register for the National Mulesing Accreditation Program (NMAP), call 1800 221 076. EverGraze Fact Sheets. EverGraze is developing and testing new farming systems in different environments across the high rainfall zone of southern Australia. Download the fact sheets listed below from http://www.evergraze.com.au/ and use the library search function on the home page to search by topic and keyword. FeralMone™– a spray-based lure designed to increase visitation of wild dogs or foxes to bait or trap sites and to assist in bait uptake. Feralmone™ is available from rural merchandisers and agencies responsible for fox and wild dog control programmes (all state agencies except Department of Primary Industries Victoria or Dept of Agriculture & Food WA).